In America, Hillary Clinton was the first female candidate to be nominated for President by a major political party in US history. The ballyhoo, balloons, and b.s of the event is somewhat foreign to most (if not all) other political processes in the OECD, but the significance of the Democratic Party Convention should not be underestimated. The USA is a diverse entity with a range of political, social, and economic attitudes as wide as the country itself. But the prospect of either major party nominating a female candidate for President would have been unthinkable even a decade ago. So how will it all turn out in November? Who knows - the British Prime Minister Harold Wilson once famously said that a week is a long time in politics, so the intervening months could see significant moves for and/or against either candidate. But in a straw poll of absolutely no statistical significance whatsoever, nobody I spoke to at the National Adviser Conference in Auckland last week had anything favourable to say about Donald Trump. The other historic convention was indeed the aforementioned National Advisers Conference held in Auckland with over 600 attendees present. Readers may remember that I waxed lyrical in the wake of the 2015 Conference, and I have no hesitation in repeating my support of this most recent event. From the opening addresses of Dr Oliver Hartwich and Karen Schaeffer to the closing presentation of "Last Man Standing" by Australian gold medal Olympian Steve Bradbury - and with just about everything in between - the atmosphere and quality of the Conference exceeded its predecessor. I indicated last year that the PAA and IFA people had set a high bar to emulate the success of the 2015 Conference, but emulate it they did. Mike King was a simply outstanding MC - adaptable, humorous, pithy, and at times poignant - taking his audience through a range of emotions as a well-polished, accomplished, professional. Michelle A'Court added immeasurably to the tone of the Conference dinner - a witty but pointed delivery that resounded with all and that would find infinite support from the Democrat Party's nominee at the other venue mentioned! The Trade Exhibition and networking area - located in one place - also worked very well. However, there was one development that stood out of enormous significance. 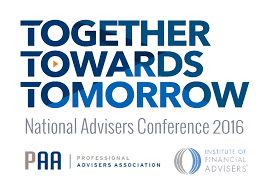 This year's Conference saw the historic announcement that the members of both PAA and IFA had voted overwhelmingly to approve the formation of a new organisation embracing a broadened constituency of consumers and advisers. It is frequently the case that being present when something of significance occurs, the impact of the event is not always immediately appreciated or understood. But in years to come, the 2016 National Advisers Conference will be regarded as a watershed moment in the evolution of the NZ Financial Services industry. Against a background of a rapidly maturing regulatory regime, NZ advisers have realised that expanding their unified presence to include consumers in their organisation offers the best opportunity of presenting a more acceptable presence of their services to the wider community. While there will be those who doubt, and even those who oppose, that bringing effective contribution to both these set of constituents is possible, this is an opportunity that should not be missed or dismissed. Financial Advice New Zealand is a unique development in my experience. Where other countries have torn their financial services industries apart, damaged the existence of non-aligned financial advice, and created absolutely zero added value for consumers by continually piling on adversarial measures, policies, and regulations, New Zealand Financial Advice represents an inclusive collaborative opportunity that other territories have simply been unable to contemplate. Everyone involved in our industry - product providers, advisers, institutions, consumer representatives, and regulators - should be unequivocally supportive of this initiative. Creating consensus is never an easy path to take in the face of traditional enmities, philosophical differences, and opposing perspectives of ideal outcomes. However, consensus based on flexibility, compromise, and expediency, simply must be developed in order to avoid replicating the negative, destructive experiences visited upon the financial services industry elsewhere. Not many in the NZ industry have had first-hand experience of the U.K. and Australian regulatory regimes. Having operated in both - and having worked for AIG for over a decade - please take it from one who knows that this initiative should be given every opportunity to succeed. Previous attempts at developing any sort of united front foundered on the rocks of implacable attitudes, a lack of vision, and resistance to meeting the other stakeholders half-way. It is now time to bury the hatchet and support, contribute, and participate in the advent of Finanical Advice New Zealand. Talking with Rod Severn, Michael Dowling, Fred Dodds, and Bruce Cortesi - and many others involved - I became acutely aware of the scale of the collective effort that has gone into taking the initiative this far. These good people deserve our appreciation and applause for the hard work that has already gone into the Financial Advice New Zealand initiative - and now the hard work begins. So the US Democrats and NZ advisers have created their own unique pieces of history in their respective locations - best wishes to both for resounding success with their respective challenges.